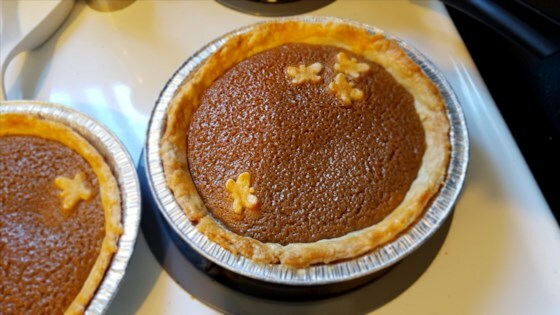 "Brown sugar pie is a basic pie from Quebec, Canada. In French, it is Tarte au Sucre Brun. Delicious!!" In a saucepan, combine flour and sugar. Stir in milk, butter, salt and vanilla. Cook, stirring constantly, until mixture comes to a boil. Pour into an unbaked pie shell. Bake at 400 degrees F (200 degrees C) for 5 minutes. Reduce heat to 350 degrees F (175 degrees C) and continue baking for 25 minutes. Unbelievably easy to make. I liked this simple pie, it was like a pecan pie without the pecans, and not as sweet. But still good. I had to do a report in my French class, and use a food example. I used this pie and everyone loved it. I am 12 years old. I served this on Christmas'eve. I'm Canadian and I remembered this pie from my childhood. It was very good and easy to make. This was fantastic! I have lived in Quebec all my life and have never tasted a Tarte au Sucre as tasty as this one! Great recipe, super easy and quick clean up! Thanks Suzanne! Merci!